How the heck did I come up with this one? Easy, really. 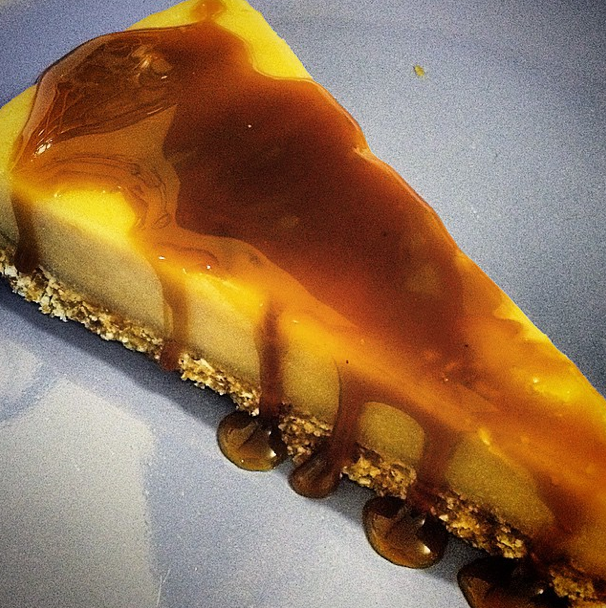 While searching for a traditional Anzac biscuit recipe earlier in the week, I came across a recipe for an Anzac Cheesecake… a traditional, cheesy cheesecake. 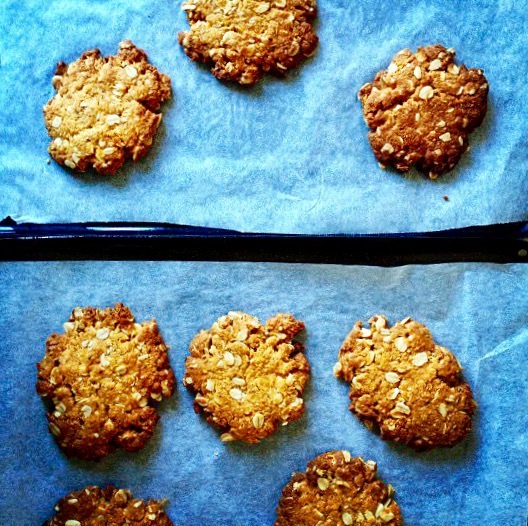 Since I love the raw cheesecake phenomenon, I instantly mulled over what ingredients I would use, to get the flavour of an Anzac biccie. So where to start? 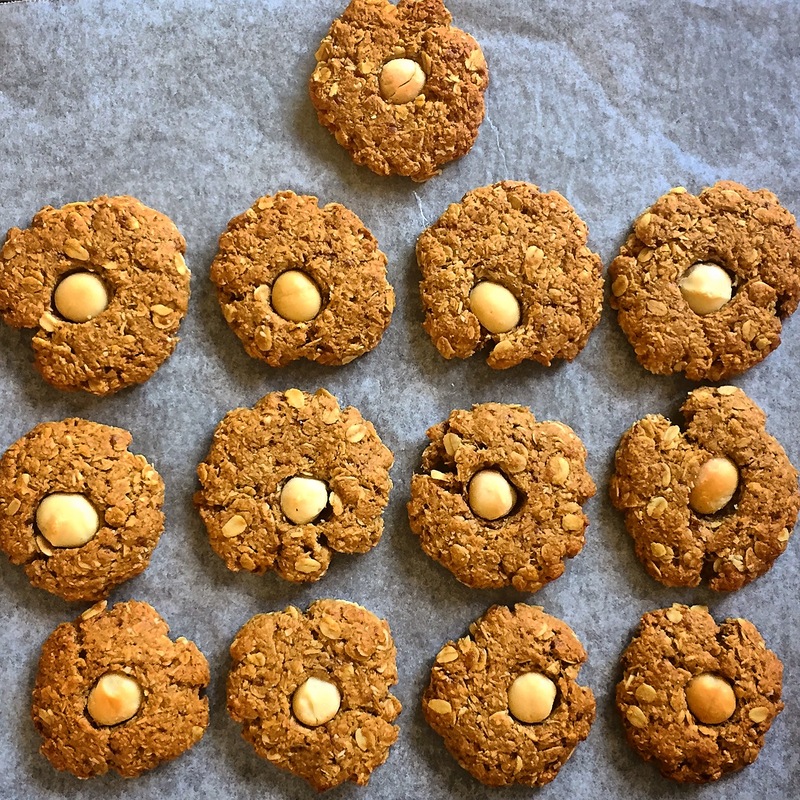 Well, the traditional biscuits are primarily comprised of oats, flour, sugar, desiccated coconut, golden syrup (‘treacle’), butter and the result is a wonderful ‘caramel’ flavour. 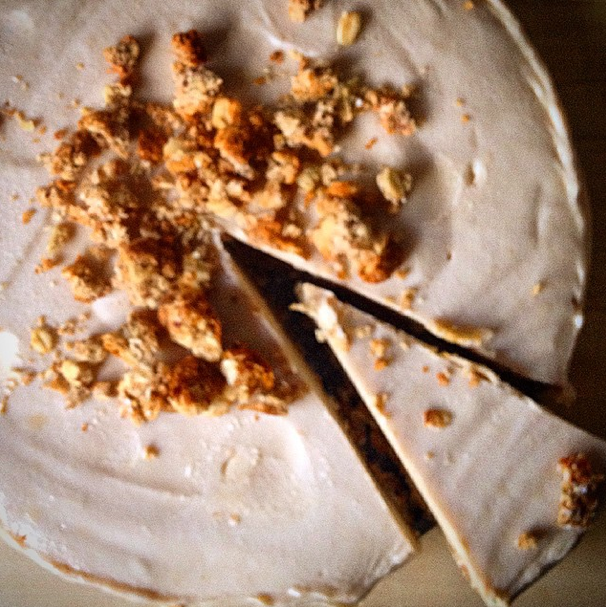 I could envisage the oats & desiccated coconut in the cheesecake base (sorry, this isn’t gluten free people: but you could easily substitute almonds or buckwheat instead) but what about the cheesy filling? There are three stages to the cheesecake’s creation, and since one does involve cooking, I can no longer claim this as ‘raw’. Firstly, I made a salted caramel sauce (recipe sourced from Quirky Cooking – see here) then created the base, and finally the macadamia/coconut cream/salted caramel filling. And I was blown away by the result! For the caramel sauce I used 50gm coconut sugar, 50gm coconut cream, 1 teaspoon vanilla extract & a good pinch of Himalayan Salt. I put all of these in the Thermomix for 3mins @ 100º, speed 2. For those without this piece of equipment, I apologise but I can only guess that you would add all the ingredients into a small saucepan and stir continuously (probably for more than 3 minutes I imagine) until the mixture thickens. (Be careful you don’t let it go too long, it will burn quickly. But then, burnt caramel is another flavour in itself, and maybe it could work?!) Empty into a jug or cup and set aside. For the cheesecake base I blended 1 cup of dates, ½ cup oats and ½ cup of desiccated coconut until fully granulated (Thermies up to 15 seconds, speed 9-10). Grease your dish with coconut oil, tip the base mixture in and using a spatula (or clean hands?) press firmly and evenly across the base. Place it in the refrigerator. For the filling I played around a fair bit! But in the end I used: ¼ cup of the prepared salted caramel sauce (that’ll be almost the whole lot), 1 heaped cup of (approx. 250gm) macadamia nuts, ½ cup coconut cream, ¼ cup coconut oil. Firstly, I milled the macadamias (Thermies 10sec, speed 9-10) then added the sauce, blending for about 10secs, from speed 5 increasing to 9) Next add the coconut cream and Thermomix or not, you’ll need to blend a few times, stopping to scrape down the sides. My thought was, the more you blend, the better the aeration of the coconut cream, as well as further milling the macadamia particles. Finally add the (liquified) coconut oil, and I let this one go at speed 9 for almost 40 seconds. Pour the thick filling into your prepared base dish, then simply freeze. I left mine overnight so I would highly recommend you leave it for at least one hour. It may stick fast to the base of the dish so gently warm the base (melting the coconut oil you greased the dish with) and it should come out with a little more ease. I garnished the finished product with a crumbled Anzac biscuit (I also make vegan versions of those) but leftover salted caramel sauce drizzled over the top is divine!